Photo of the Day: Greetings from Ruby’s Snow Mountain Resort! The New Year’s Day Polar Bear Swim in Coney Island is always a joyous occasion. We felt a bit subdued this year due to the ongoing demolitions and evictions, but seeing so many of our Coney Island friends at Ruby’s Bar on January 1st put the “happy” in “Happy New Year” for ATZ. Here’s our flickr slide show from the day. In the above photo, our friend Dano, best known as the photographer behind the lens of East Coast Images, is seen sunbathing on Ruby’s snow mountain before taking the Plunge. With today’s predicted accumulation of 2 to 4 inches on top of the snow already on the Boardwalk, you may want to head out to the People’s Playground this weekend to frolic in the snow. If you missed the New Year’s Plunge, keep in mind that members of the Coney Island Polar Bear Club swim in the Atlantic at 1 pm every Sunday from November through April. Visit the Bears’ website for info on joining them for a guest swim or simply spectating. 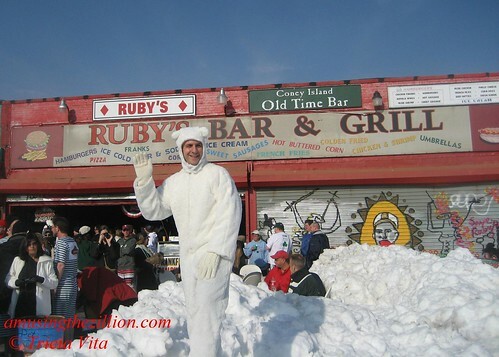 It’s a great way to enjoy Coney Island’s ambiance during the winter season. After the swim, drop by the Freak Bar at Coney Island USA for Sunday Brunch–“Bagels, coffee and characters”– at 2 pm with the Polar Bear Club. Bratva Bar and Restaurant on Surf at 12th also open for coffee, drinks and food at 2 pm. Live music starts at 3 pm. It was nice meeting you at Ruby’s and finally putting a face to the name, Tricia. Long Live Ruby’s!